Er sieht aus wie ein Cowboy aus dem Bilderbuch. In der Tradition von Hank Williams und Merle Haggard steht er für den echten Country-Sänger, dem man jedes Wort glaubt und der Tränen in die Augen bringt. Gemeinsam mit George Strait verkörpert Alan Jackson den neotraditionellen Country. Er gehört zu den beliebtesten Honky-Tonk und Western-Swing-Sängern Amerikas. Jackson hat über sechzig Millionen Alben verkauft, was ihn unter die zehn Country-Bestseller aller Zeiten bringt. Mehr als zwanzig Singles von ihm führten bisher in den US-Charts. Jeder Country-Fan kennt "Don't Rock the Jukebox", "Chattahoochee" und "Where Were You (When the World Stopped Turning)" von ihm. 2014 feierte Nashvilles bekanntester Schnurrbartträger sein 25-jähriges Karriere-Jubiläum. Was ist das Geheimnis seines Erfolgs? Alan Jackson ist als Countrysänger das Pendant großartiger Method-Actor wie Marlon Brando: "Seine Größe macht aus, dass er scheinbar gar nichts macht", kommentierte kürzlich sein Kollege Joe Nichols im TV-Special "The 20 Greatest Men in Country Music" bei CMT. "Er bringt den Song einfach rüber, und das macht er mit einem sehr guten, ehrlichen, traditionellen Country-Twang." Jackson bleibt immer komplett er selbst. Die meisten Songs seiner bisher veröffentlichten 15 Studioalben hat er selbst geschrieben. Alan Jackson kam 1958 in Newnan, Georgia zur Welt, als letztes von fünf Geschwistern. Sein Vater war Automechaniker, und auch er machte zunächst nach der Schule eine Lehre, arbeitete auf dem Bau. Mit zwanzig gründete er seine erste Band. 1979 heiratete Jackson seine Highschool-Liebe Denise, mit der er heute noch zusammen ist und drei Töchter hat. Die frühen 1980er hindurch hielt er sich mit Gelegenheitsjobs und sporadischen Auftritten über Wasser. 1985 zogen sie nach Nashville. Vor seinem Solo-Debüt arbeitete Jackson im Nashville-Network: als Songwriter und Demosänger. Für 25 Dollar sang er das Demo von Travis Tritts erstem Hit "Country Club". 1989 nahm ihn das damals neu gegründete Label Arista Records unter Vertrag. 1990 erreichte Jackson mit seinem Debütalbum "Here In The Real World" die Top-5 der Countrycharts. Das Album hielt sich dort über ein Jahr und etablierte ihn in der Fünften Generation neuer Countrysänger, an der Seite seines Freundes und Rivalen Travis Tritt, neben Vince Gill und Brooks & Dunn. Sie alle gingen nach dem verwässerten Pop-Country der 1980er back to the roots. "Den größten Antrieb bekam ich damals davon, dass wir nichts hatten, als ich aufwuchs", sagt Jackson. Anders als viele seiner Peers hat er nie in seiner Jugend Popmusik gehört, sondern nur traditionellen Country. So einfach erklärt sich der puristische Sound Jacksons. Seine nächsten beiden Alben "Don´t Rock The Jukebox" und "A lot About Livin´(and a little `Bout Love)" brachten jeweils fünf Nr-1.-Singles hervor, darunter die Hymnen "Love´s Got a Hold on You" und seinen Signature-Song "Chattahoochee". Mit dem darauf folgenden Longplayer "Wo I Am" knackte Jackson die 10-Millionen-Verkaufsmarke in den USA. Das Trauma von 9/11 verarbeitete er im Song "Where Were You (When the World Stopped Turning)", mit dem er seinen ersten Grammy gewann. In dieser Zeit stand bei Jackson auch ein Bluegrass-Album in den Startlöchern. Es wurde aufgrund des alles überrennenden Film-Soundtracks von O Brother, Where Art Thou? jedoch auf Eis gelegt. 2006 produzierte die Bluegrass-Prinzessin Alison Krauss das Studio-Album "Like Red On A Rose" von Jackson, das sich jedoch nicht vom traditionellen Country weg bewegt. Den Traum des Bluegrass-Albums erfüllte sich der Country-Singer-Songwriter 2013 mit seinem jüngsten, schlicht mit The Bluegrass Album betiteltem Longplayer, der acht Original-Songs aus Jacksons Feder und drei Cover enthält. Der Einzug in die Bluegrass-Arena – ein Unterfangen, an dem sich so mancher Country-Kollege die Finger verbrannte. Puristen betonen die verschiedenen Wurzeln beider Genres: Bluegrass ist ein Kind von Folk und Jazz. Es geht dort nicht so sehr ums Geschichten erzählen und mehr um die Musik. Doch die US-amerikanische Fachpresse hat Jacksons "Bluegrass Album" den Echtheits-Stempel gegeben. Der 56-Jährige sei "durchaus ein Bluegrass-Songschreiber" und habe "mit dieser Veröffentlichung den Nagel auf den Kopf getroffen. Seine Originale erreichen das Herz und die Seele von Bluegrass", rezensierte das Bluegrass-Magazin Cybergrass. Was er auch macht, er macht es richtig. Alan Jackson lässt seine vielen Fans nach mehr hungern. When he was a young gun, Alan Jackson attempted to sound like an old soul, so it's unsurprising middle age suits him, finding him deepening rather than struggling. 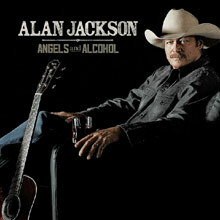 After spending a few years casually exploring his roots -- he cut a second gospel record and his first full-length bluegrass records -- the traditionalist returns to straight-ahead country on 2015's Angels and Alcohol. Working once again with his longtime partner Keith Stegall -- they've been together since Alan's 1990 debut Here in the Real World, taking only a short break in 2006 -- Jackson doesn't attempt anything new but he's also not living in the past, sliding references to cell phones into the quietly romantic "The One You're Waiting On" and generally acting his age, happy to be faithful, committed, and comfortable. Alan manages to not sound complacent on Angels and Alcohol because like all great country singers -- and he long ago established that he belongs in the pantheon of great country singers -- he thrives on the little telling details, whether they reside within a lyric or the freshening of a familiar three-chord turnaround. It helps that his pen is sharp on this record -- he writes all but three of the album's ten tunes, often favoring supple and slow tales but also loosening up for the cheerful Western swing of "Flaws," the driving "Mexico, Tequila and Me," and the first single "Jim and Jack and Hank," which boogies in a fashion similar to "Who's Cheatin' Who" -- but often the real appeal of Angels and Alcohol is in the singer, not the song. As the album rolls on, it's easy to get sucked into his eloquent phrasing and assured band. He might not be trying anything new, but it's a pleasure to hear a master enjoying his work. 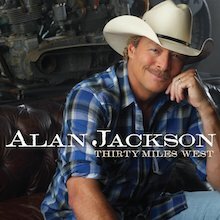 Splitting from his longtime label Arista, Alan Jackson sets up his ACR Records imprint at EMI and releases Thirty Miles West, his 15th collection of new songs. Jackson doesn't use this opportunity as a rebirth but rather a continuation, stripping away the barest hint of extra fat left upon his 2010 Arista farewell Freight Train and delivering his leanest hard country album in years. Unlike his albums of the 2000s, which flirted with the digital age via cutesy novelties like "www.memory," this doesn't bother with the present and often looks toward the past, Jackson enlisting Zac Brown for a nostalgic trip down his hometown "Dixie Highway" and envisioning how he's "Gonna Come Back as a Country Song." There's a constant tugging undercurrent of comfortable regret flowing underneath Thirty Miles West, whether he's stoically playing the part of the bad guy on the dry-eyed ballad "So You Don't Have to Love Me Anymore" or seeing his lifetime love almost slip away on "When I Saw You Leaving (For Nisey)," the explicitly sad songs neatly balanced by breezy drinking anthems -- he's sipping margaritas, not beer, on "Long Way to Go" -- and rockers so cheery it's easy to overlook how Jackson is talking about how life keeps bringing him down. Over the years, Jackson has perfected that smooth easy touch and here, on a record devoted to new songs written in the classic tradition (many written by Jackson himself, others penned by Terry McBride, Al Anderson, Shawn Camp, Jay Knowles, Adam Wright, and Guy Clark), he is a master of understatement in both his delivery and construction, the songs slowly seeping into your marrow. It's an album only an old pro could make and it's one of the best this ever-reliable singer has ever done. 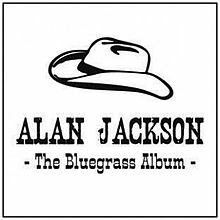 Ten studio albums into his career, Alan Jackson takes a bit of a breather with 2006's Precious Memories, his first ever gospel album. Not coincidentally, it's his quietest record to date, as hushed and reverent as a Sunday service, with each track boasting little more than a piano, acoustic guitar, harmony vocals, and maybe an organ. There may not be much musical variety to these spare, intimate arrangements, but they suit this set of sturdy traditional gospel classics, and they also suit Jackson, who always has been eager to pay respect to his idols and influences. On most of his albums, this reverence doesn't sound overly reverent since he does sing loose, rocking honky tonk and indulges in a sense of humor, two things that help illustrate his good taste. Here, every song is deliberately calm and consciously tasteful, which may make for perfect music for church, but hardly makes for a dynamic record. As the album rolls on, the similarity in tempo and arrangements gives the album a monotonous, sleepy quality; each individual track is well crafted and sincere, but taken as a whole, it all blurs together and winds up seeming twice as long as its 37 minutes. But even if Precious Memories winds up as something slightly underwhelming, there's no denying that this is precisely the album Jackson wanted to make, one that's consistent in tone and exact in its vision. It may not make for everyday listening, even an album that would be played every week, yet it would make a good soundtrack for a reflective, reverent Sunday afternoon. Alan Jackson has had quite a run. At 54, he's had nearly a quarter of a century of being a big ticket draw in country music, with 25 number one country hits under his belt and a solid reputation as perhaps the best neo-traditionalist singer and songwriter of his generation -- he's certainly been the most commercially successful. Times change, though, and contemporary country stations, in love with younger stars and a hybrid country/rock/pop sound, don't play Jackson much these days, if at all. Jackson appears to have accepted that, because this set, his 15th studio album, finds him going bluegrass, a genre country music stations aren't likely to lend much credence to. There's nothing too startling on The Bluegrass Album. It's bluegrass, after all, and Jackson's warm, familiar voice drops right in among the banjos, mandolins, and fiddles like it was born to be there, and he wrote most of the songs here, including the fine opener "Long Hard Road," and the interesting "Blacktop," where Jackson takes issue with contemporary country's fascination with dirt roads, which, Jackson wryly notes, are full of pot holes and stir up dust which gets all over the washing when it's hung out to dry. He also pulls off a few covers, including Adam Wright's (Wright co-produced this set with Keith Stegall) "Ain't Got Trouble Now," the Dillards' "There Is a Time," and a 3/4 waltz time version of Bill Monroe's classic "Blue Moon of Kentucky," each of which fits in nicely with the eight originals Jackson wrote for this project. In the end, Jackson's foray into bluegrass seems easy and natural, as if he'd been playing it all along. Contemporary country stations might not play it, but Jackson is unconcerned. He's earned the right to drop out of the rat race and do whatever he wants to do, and for now, that means bluegrass. Live at Texas Stadium captures a concert Alan Jackson, George Strait and Jimmy Buffett gave at the venue on May 29, 2004. What connects these three? Well, Jackson and Buffett dueted on the chart-topping "It's Five O'Clock Somewhere," they're all superstars renowned for giving audiences their money's worth, and in 2004, Buffett released his country crossover License to Chill, so what better way to promote the platter than with a concert with the biggest country star of the 2000s and a legend? It made perfect sense and it made for a good show, too, if Live at Texas Stadium is any indication. According to the poster (which may or may not be accurate) featured in the CD booklet, the batting order for this particular show had Strait opening, Jackson hitting in the middle and Buffett closing it down, which is more indicative of the crossover nature of Buffett's crowd than the fact that he's a bigger country star than either Strait or Jackson. 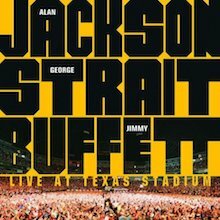 On record, Jackson and Buffett swap places, but position in the lineup doesn't matter as much on record as it does in concert, since it's possible for a listener to start listening anywhere -- and no matter where you start Live at Texas Stadium, it's one big party. And like any party with too many guests, different listeners will gravitate toward different groups of people. Those who like their country served straight-up naturally will find Strait's set the best, since he and his band have a casual virtuosity that's mesmerizing for its ease. Those listeners will also play well with Jackson's crew, who may not be as steeped in tradition as the Ace in the Hole Band but they sure can play pure country with skill and heart, and they provide the bridge to Buffett, who, as always, is the self-styled life of the party. Longtime Parrottheads will be familiar with his shtick -- the boisterous between-songs babble, the jokey asides on "Hey Good Lookin'" -- and find it intoxicating, but Strait fans may just see Buffett as intoxicated, and skip by his numbers. That said, Strait and Buffett play well together -- Strait isn't as loose as Buffett, but they harmonize well on "Sea of Heartbreak," and Jackson acts as the amiable host, bringing these two sides together and ensuring that everybody on-stage and in the audience (and now at home) has a good time: and they do. And it's good enough to take home a souvenir, since Live at Texas Stadium can serve as a soundtrack for many a summertime party in the future. 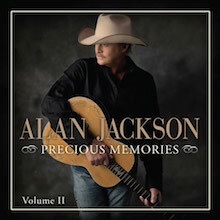 The difference between Alan Jackson's 2006 album Precious Memories and its 2013 sequel Precious Memories, Vol. 2 can be seen in the cover art as well as heard in its grooves. On the cover of the 2006 album is a sepia-tinted photo of Jackson sitting on the steps of an old church; on the cover of Vol. 2 is a crisp, clean color snapshot of the singer in a studio, consciously posing for the camera. Similarly, the first Precious Memories sounded old and dusty, as authentic as a small-town church, but this second volume is stark and bright, sounding as contemporary as the day it was recorded. This transparency doesn't hurt this collection of familiar hymns -- "Amazing Grace," "O How I Love Jesus," "Precious Memories," "When the Roll Is Called Up Yonder" are some of the featured tunes here -- but this does mean that the album doesn't feel quite as warm and cozy as its predecessor. Nevertheless, this is a reverent, resonant spiritual album distinguished by its sweet sincerity. 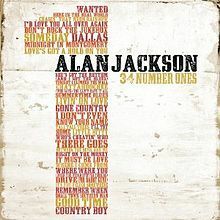 The 20-year anniversary of Alan Jackson’s first Top Ten hit is the perfect occasion to release a collection like 34 Number Ones, a double-disc set rounding up the great majority of his blockbusters. Technically, the title bends the truth a bit and not just because three of the cuts -- “Ring of Fire,” “Look at Me,” and the Zac Brown Band duet “As She’s Walking Away” -- are new. “Chasin’ That Neon Rainbow,” “Here in the Real World,” “Tonight I Climbed the Wall,” “(Who Says) You Can’t Have It All,” and “Who’s Cheatin’ Who” never topped the Billboard charts but a comprehensive Alan Jackson hits collection is unimaginable without them, so they’re here alongside all the number one hits from 1991 through 2008. Jackson certainly has more to offer than just number one singles -- his facility with slow-burning torch songs and gospel is absent here, as are several singles that never reached the upper echelon of the charts (“Pop a Top,” “The Talkin’ Song Repair Blues,” “USA Today,” “A Woman’s Love,” “www.memory,” “It’s Alright to Be a Redneck,” “When Somebody Loves You”) -- but by its very length 34 Number Ones is the first of his compilations to really suggest the depth and breadth of his body of work, and it’s a tremendously entertaining listen to boot.